"Larnel doesn't know his neighbor, Mrs. Katz, very well, until he asks her to adopt an abandoned kitten. Mrs. Katz agrees on one condition: that Larnel help her take care of the kitten she names Tush. When Larnel starts spending more and more time with Mrs. Katz to help with Tush, Mrs. Katz tells him stories about coming to America from Poland and about the good times she spent with her late husband. As Larnel grows to love Mrs. Katz, he also learns about the suffering and triumph black history shares with the Jewish heritage. FYI: For those that are also doing Five In a Row (or thinking about it! ), this should go without saying, but many of the things we do during our rows may or may not be suggested in the manual; our activities may extend beyond the suggested lessons or we may add things just because I think it would be a fun "extra." In no way, does what we do replace the importance of the manual!! Added another flag to our garland! 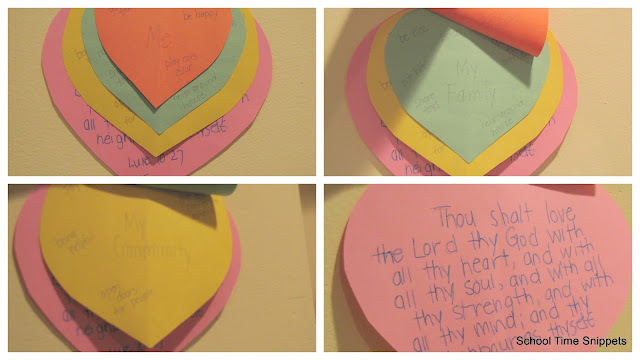 I printed off a kid-friendly version of the Passover Story and read it to T and then used some Passover resources from Homeschool Share to make a file folder activity about the Ten Plagues of Egypt. In talking about Passover, we learned about the Seder Plate. We stapled the images we found at Nick Jr. to the plate and then wrote the significance of each item underneath. I found this to be a very interesting study; just one thing I "knew/ heard of" but didn't really understand. Although, Passover has passed, check out 123 Homeschool 4 Me's actual Seder Meal-- what a wonderful experience for the whole family. There were many Yiddish words in this story; we had fun saying many of them. In fact you may say some Yiddish words yourself and not even know it, like "tush" (aka buttocks)! This was not part of the FIAR lessons, but I thought it would be good writing practice. 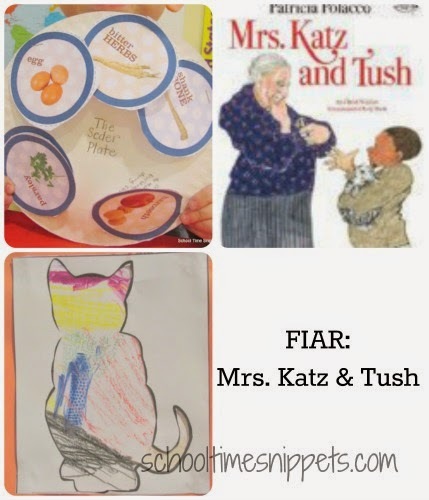 In the story, Tush gets lost and Mrs. Katz and Larnell pass out signs around the neighborhood to try and find him. T drew his own "Lost Cat" poster. Has anyone seen his orange cat named, "Pastel"?? This was a great lesson on paying attention to the details. There are lots of different patterns and textures in this story, so we decided to go on a pattern/ texture hunt ourselves! T and I walked though the house with markers and crayons in hand and rubbed over the different designs we found. Next I printed off I printed an image of a cat, cut it out and then placed it over our texture rubbings. Not sure what book we used, but T practiced following directions on "How-To" draw a cat. We simply read a few Non-fiction books about cats. I have been meaning to head over to an animal shelter/ adoption facility that is down the road, but we just haven't made it there. I am not sure what this was supposed to look and/or taste like, so I have no idea if it "turned out" right. We did follow the directions, but in the end neither one of us were fans of it. Here is a great index of Jewish food if you are ever needing to make something!